single-edged sword sax used mostly in the early Viking Age in Norway. Scabbards were made of wood covered with leather. Inside the sheath were laid skin, waxed cloth or sheepskin with wool to prevent the formation of rust on the blade. From 8 th to 11 th century the whole of Europe trembled before the Scandinavian pirates who plundered the coast at first, but later began to penetrate into the depths of the continent. The Vikings were not only raiders but also excellent navigators, warriors, artisans, merchants and colonists, looking for a new land because of overpopulation, its meager homeland. At first only a few of the Vikings could afford expensive swords and chain mail. Lack of protective equipment offset the suddenness and ferocity of the attack. 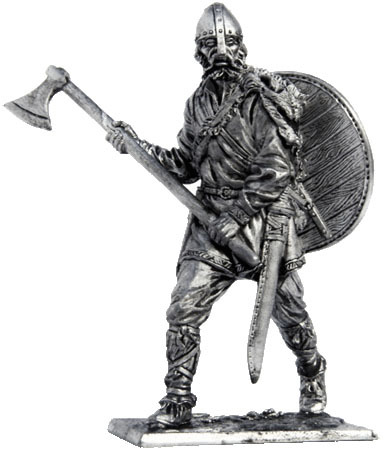 Vikings preferred to a powerful and massive strike weapons - such as the Battle Axe or the "Danish Axe". Blade of a hatchet was chopping edge length of 20-30 cm edge itself is often made ​​from better quality steel and weld on the main part of the ax. Fitted on the handle length 1,5 m ax crushing not only the helmets, shields and armor, but the horse skull, oars, mast and board ships, and even the fortress gates. Such a weapon had to keep two hands and flip the shield on his belt behind his back. Axes were given poetic names: "A friend of the Shield, " "Fighting the Witch, " "Wolf wounds. " Notify me of updates to Viking with an ax, 9-10 cc.